Marsha Ann Wiecks Wright died in her Seattle home on 01.15.19. She was born 09.06.1946, and grew up in Southern Minnesota where she attended Macalester College in St. Paul and Minnesota State University in Mankato. Nearly 35 years ago she relocated to Seattle where she has been a classical pianist as well as a piano teacher. As a board member of the Seattle Teachers Music Society, she help create Seattle's first "Sonatina Festival". She was a member of the American Federation of Musicians, Seattle's Ladies Musical Club, MENSA, and the Seattle Congregational Church. She is survived by her devoted friends and caretakers: Gloria and Kathy; her favorite cousins: Carolyn Hess and Debbie Walter and their families; her sister, Sandra Kay Rollings and family; as well as other family members and friends. As per her request, no religious services will be held, and Marsha asked that those wishing to send a remembrance be directed to donate to the National Planned Parenthood. Family, friends, and fans are invited to participate in "A Gathering of Friends" which has been scheduled for Sunday February 24th 2-4 pm. Please contact 206.323.7454. Deepest sympathy to Marsha's sister, Sandra Kay Rollings and family in Minneapolis, mn. My deepest sympathy to all of Marsha's loved ones and her beloved students. She was an accomplished, generous person and I wish that I had known her better. I am so glad I had a chance to spend a day in October with my dear cousin Marsha when she was back visiting family in Minnesota. She was an amazing person and someone who brought so much joy to her family and friends. You are loved, Marsha, and you will be dearly missed. Marsha brought music and laughter into all her friends' lives; she was a joy to know, and will never be forgotten. I live in the hills of Southern Italy now, still think of Marsha daily, and play our favorite hymns on Youtube and pretend she is sitting next to me on the piano bench. Prayers and love to her sweet sister Kay, and her many family and friends that loved her. Rest In Peace pain free Marsha. Marsha was an amazingly talented and beautiful high school classmate. She brought such enthusiasm and talent to everything she did from being a cheerleader at all of our sporting events, to senior class president, to homecoming queen candidate, to her piano accompaniment of the Amboy High School choir. She played a special role in being my accompanist for numerous vocal performances including our high school vocal/piano recital which included her superb solo performances. I have missed her since the day we graduated, but followed her wonderful career understanding that she has touched so many more. God bless you, Marsha, and may you rest in peace knowing that you made a huge difference in so many lives. Passionate and dedicated, Marsha served on the SMTA Board as a Board Member At Large; VP of Recitals, and President-Elect. One of Marsha’s major accomplishments was the creation of the annual Sonatina Festival, a performance opportunity for teachers and students of all ages and instruments to celebrate the sonatina form. Marsha enthusiastically chaired the Festival and envisioned the performance of sonatinas from all historical periods including 21st century original compositions. 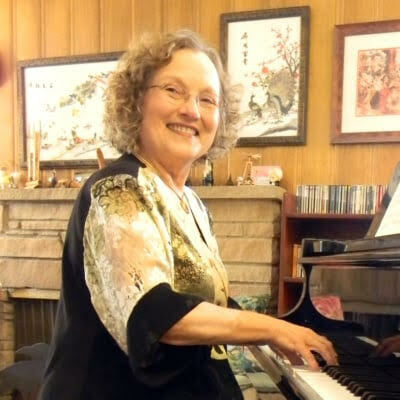 Marsha performed classical recitals in the Seattle area, was a music director at a small church, and she ran a private teaching studio for more than 25 years, exclusively teaching adults since 1995. To keep her adult students motivated and inspired, Marsha held frequent performance classes, which focused on a particular composer. Marsha never lost her zeal for guiding students through the musical discovery of each piece or composer they studied. Marsha wrote on her website that “From my four-year-old singing to my present-day teaching, I have lived my life in music.” While we mourn her loss, we can rest assured that she is singing with the angels.